When I was in the eighth grade, a friend of mine contracted a cold. Instead of staying home and watching The Price is Right like any normal child would, he decided that not only was he going to come to school but that he was also going to cure his cold. At some point, he heard that garlic is good for one’s immune system. His adolescent mind translated this to, “Garlic cures colds.” So before he came to school that morning, he downed a handful of raw garlic cloves. He suffered through the first half of the school day as a pariah because, obviously, he reeked of garlic. No one wanted to come within ten feet of him. And at lunch he went home with a debilitating stomach ache. For a few days after, he was known as the Garlic Boy. 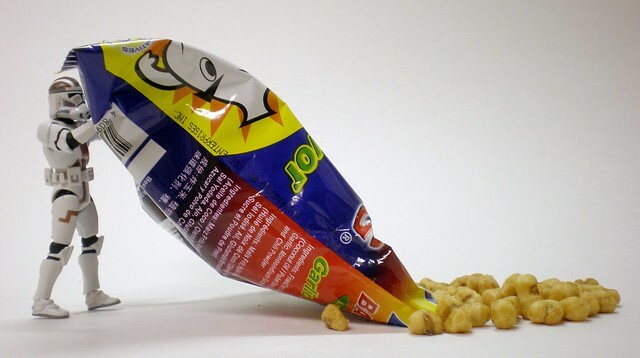 This snack from Filipino outfit KSK Food Products, Boy Bawang, also translates to “Garlic Boy.“ Boy Bawang produces cornicks, which are like corn nuts, only smaller and crispier. Or at least that’s what Wikipedia has told me. 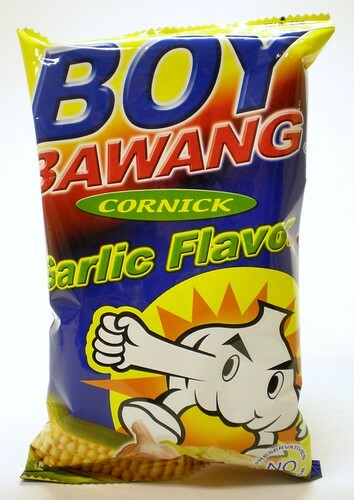 Boy Bawang makes cornicks in a variety of flavors including chili cheese and barbeque. Although I haven’t had any other varieties, they all appear to be initially flavored with garlic. 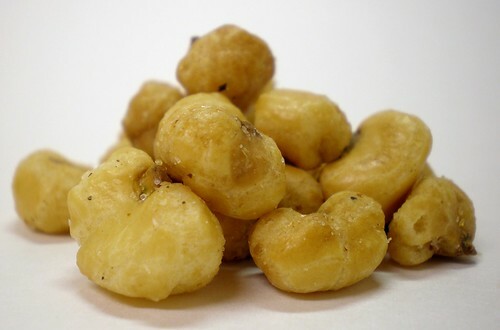 These are the Boy Bawang Garlic Flavored Cornicks. So these are either the garlic flavored version of a snack that already has a garlic base, or they are the plain variety. Either way, these are outrageously garlicky! The initial nosegrope upon opening the bag nearly made my eyes water. Turn back ye who do not wish to enter here. Every bite starts with a nearly overwhelming amount of garlic flavor. The fresh toasted corn flavor follows and is also strong, though not nearly as strong as the garlic. Then you get the not entirely unpleasant garlic burn sensation on your tongue. And finally everything ends up with a mouthful of garlic aftertaste that lingers for quite some time. I wouldn’t recommend making out with anyone after trying these (unless, of course, they’re Italian). I really like these. The garlic flavor is very powerful, and I found I could only eat a couple of handfuls at any one sitting, but they are very good and very addicting. The level of crisp is nice and they don’t leave your palms greasy or powdery. They are very well put together. If you are a fan of the Allium sativum plant, then you really need to try these. If that is not your flavor of choice, then by all means steer clear. I hope to try some more flavors in the future to see how the under-garlic works with the over-flavors. 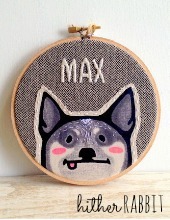 But until then, I must bid our little bulbous hero adieu. Godspeed Garlic Boy. Godspeed. I cant wait to try them just hope I can find them. This product originates from my country. Though it’s targeted for the masses (class C,D), I’m sure celebrities and our highest politicians secretly have a stash of this. 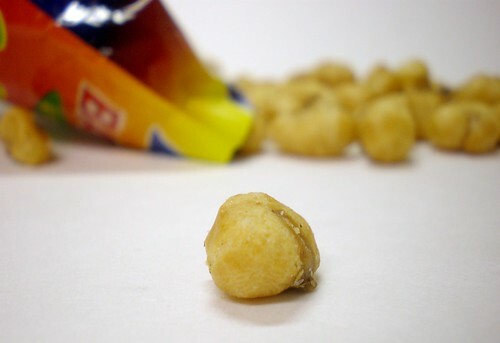 It’s just a perfect idle snack and commonly used as a substitute for beer nuts. Try the Lechon Manok flavor which means roast chicken. They got the flavor down pretty well. i would totally watch a “boy bawang” cartoon show.